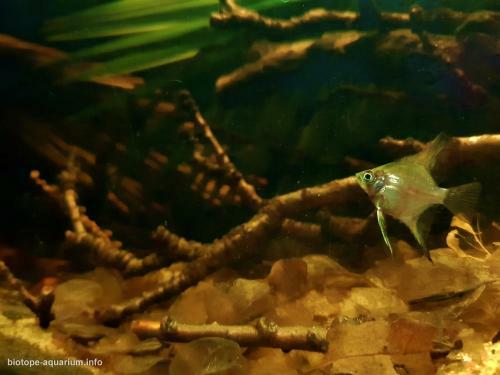 Description of decorations: The sand used is fine sand that does not hurt the inhabitants (Corydoras orcesi), it is accompanied by different leaves of trees that resemble the shape of the native trees. A network of sunken logs resembling dead roots and trees was made due to the constant floods. This model has been carefully designed for the health of fish and that no one is injured when performing the activities of living. Palm leaves that resemble Mauritia flexuosa leaves have been inserted in two states, the first one is dry, and the second one is leaves that are still green, so that the fish that need it can feed on the algae that can grow there. Description of equipment: Boyu SP-603E submersible filter, Boyu HT-8200 heater, white light 100 Watt 6500 K, Boyu thermometer. Description of the area surrounding the biotope: The geographical position of Leticia is 04°12’55” of south latitude and 69°56’26” of west longitude in southern Colombia, South America. Its height above sea level is 82 meters with a temperature that remains around 25.8°C, the lowest one is 24°C and the highest one is 27.9°. The spout starts in a morichal or cananguchal as they call it here, with the species Mauritia flexuosa. The river that adjoins the spout, has a flow rate of less than 0.5 m3/sec, with little light due to the large number of different species of palm trees that cover the sunlight, so that there is almost no underwater vegetation. In this area we find different flows that start thanks to the floods of the Amazon river during the rainy season, where small spouts are formed that do not exceed 5 metres wide and 2 metres high. Leticia is a Colombian zone that possesses a great diversity of fish, reason why the main economic activity here is fishing, and that is why, along the different beds it forms, we can find different modifications to the natural habitat due to construction of piers to meet the need. 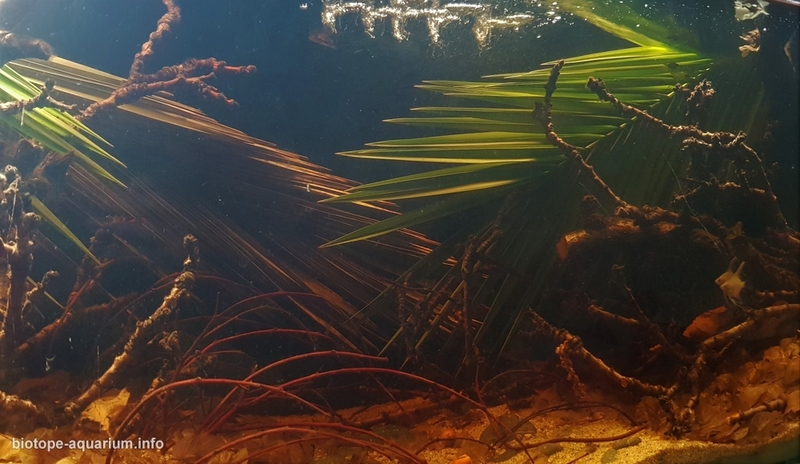 Description of the underwater landscape of the biotope: The spout has an average depth of 50 centimeters to 1 metre, with the palm trees roots dyeing the water with a pleasant amber colour. There are no floating vegetation. Due to the leaves that fall from the different trees surrounding the flow, the bottom is covered with leaves, except the center of the stream, where we can find a rocky zone and a current with a greater flow than in the sides, because in latter ones, we can find roots or remains of dead plants due to the floods of the Amazon river. The substrate is a fine sand mixed with pebbles in the center of the flow and to a lesser extent in the areas with driftwood. Description of the parameters of the habitat: The physicochemical parameters of the site are as follows: (averages) Temperature is 25.6°C, pH is 6.1, conductivity is 40.6 microsiemens and transparency is 90 cm, speed of the current is 0.045 m/sec. List of fishes: Otocinclus vestitus, Rineloricaria lanceolata, Monocirrhus polyacanthus, Apistogramma cf. agassizi, Apistogramma cf. geisleri, Crenicichla johanna, Crenicichla saxatilis, Pterophyllum scalare, Elachocharax cf. pulcher, Hemigrammus belloti, Hemigrammus ocellifer, Hemigrammus cf. 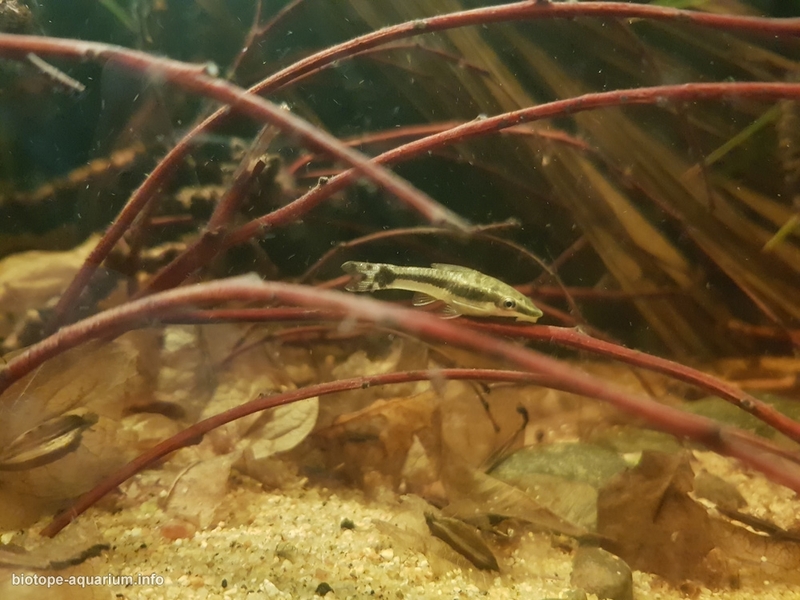 copelandi, Iguanodectes spilurus, Moenkhausia sanctafilomenae, Agamyxis pectinifrons, Amblydoras hancocki, Sorubim lima, Callicthys callichthys, Corydoras arcuatus, Corydoras pastaensis, Corydoras orcesi, Corydoras rabauti, Dianemis longibarbus, Hoplosternum littorale, Brochis splendens, Ancistrus sp. 1, Eigenmannia virescens, Cochliodon oculeus, Characidium fasciodorsale, Characidium pellucidium, Copella nattereri, Nannobrycon eques, Nannostomus marginatus, Nannostomus trifasciatus, Pyrrhulina laeta, Hemiodopsis microlepis, Carnegiella strigata, Axelrodia stigmatias. Threats to the ecology: At the moment, the different spouts formed due to the fantastic floods of the Amazon river, are disappearing, because the so called “the greatest river of the world” is in a constant withdrawal from the territory. The Amazon flow is in retreat and also the different species of fish of this rich ichthyological zone. 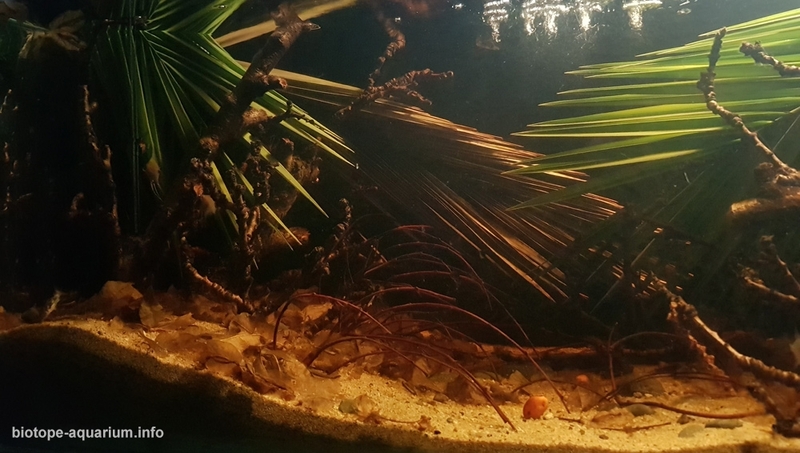 The present work, which I would call “black reef”, was made to rescue the beauty of a biotope that is on the way to extinction due to the constant manipulation of the man who builds piers, diverting the flow of the river and greatly affecting the flora and the fauna of the place. Leticia’s sewage pipe is located in an area where 3 countries are located, and therefore, economic exchange is very important and that is why the water is polluted, especially with plastic matter. The biotope I have made represents a tribute to the excellent aquaristic zone, most of the species sold come from this place. I made my child dream come true and to know a place that I will probably never know due to the constant damage of the area due to the Amazon river drought and human activity.